KWQC | What's Peeps Thinking About Now? It's Probably Random! Our turkey is thawing in the refrigerator and I can’t wait to smell its aroma Thursday as it bakes in the oven. I hope you’re ready for a very Happy Thanksgiving. 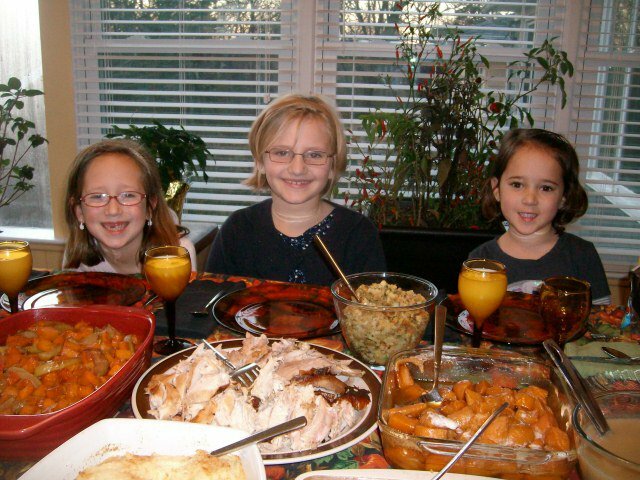 Since I have a Thanksgiving blog for tomorrow, today I’m reflecting on my favorite Thanksgivings. 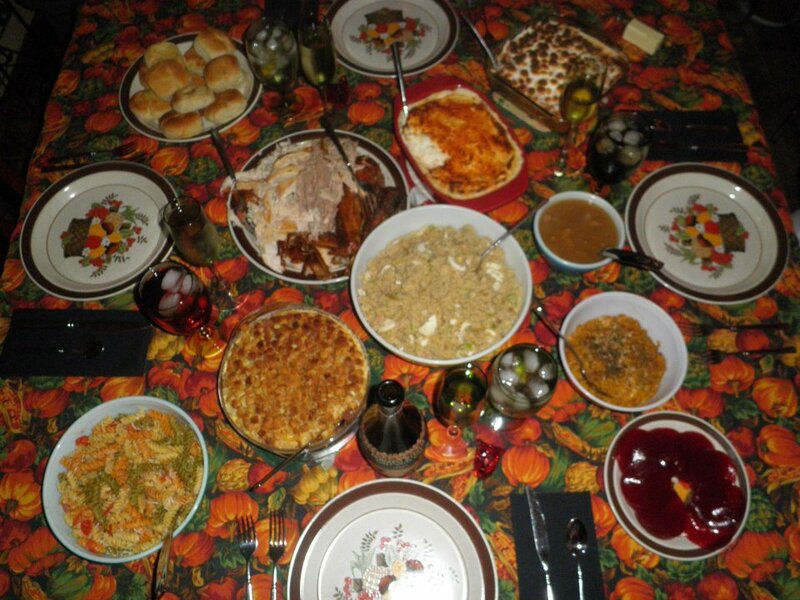 This was our feast from last year, which was Tammy’s first Thanksgiving with us in the Quad Cities. It was also the first turkey day that my sister and I spent together since 1993, my last fall in Kentucky before I moved to Chicago. Last year was also special, too, because it would be the last Thanksgiving that I would glance down from my plate and have two of the most beautiful, brown eyes looking up at me asking a bite. A bite of anything would do as long as it wasn’t bananas, jello, or apples! 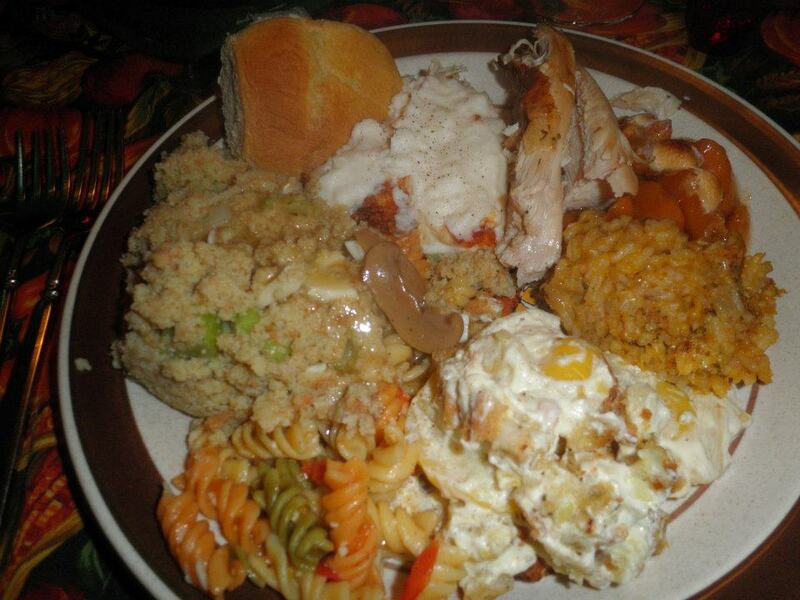 As you can see from my plate, I was eating for two. This year, I can’t use that excuse. Miss ABBA, Daddy A will have an extra bite of turkey this year just for you! Two years ago, Ray’s parents, Ray & Donna, and his sister, Ann, and her family joined us for a family feast. Gretel is on top of the world any time she gets to spend time with her cousins, Sydney and Addison. 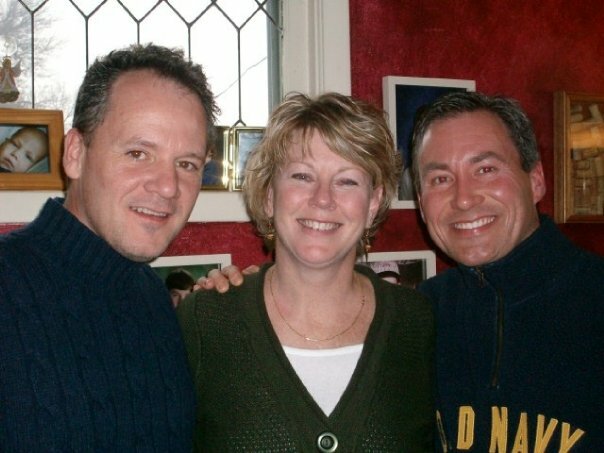 In 2009, the first Thanksgiving Ray and I were together, we spent the afternoon with our friend, Tracy, and her family. She also invited us over last year for appetizers and wine since my sister was working! 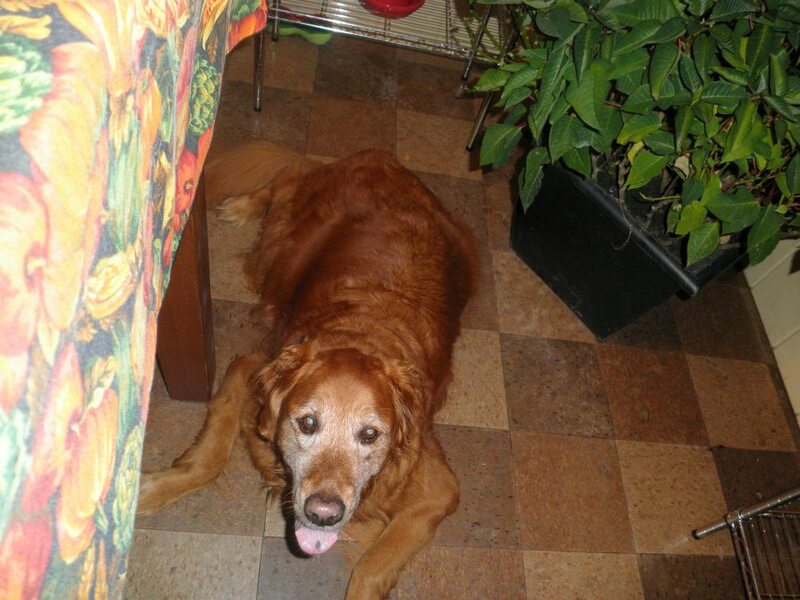 Also, at Thanksgiving 2009, Christopher, my Chicago friend, and Betty (Mom) were in St. Thomas, so Miss ABBA was doggie sitting for Mr. Panda. On Black Friday, we drove Mr. Panda back to Chicago and cooked Thanksgiving for Betty and Christopher. 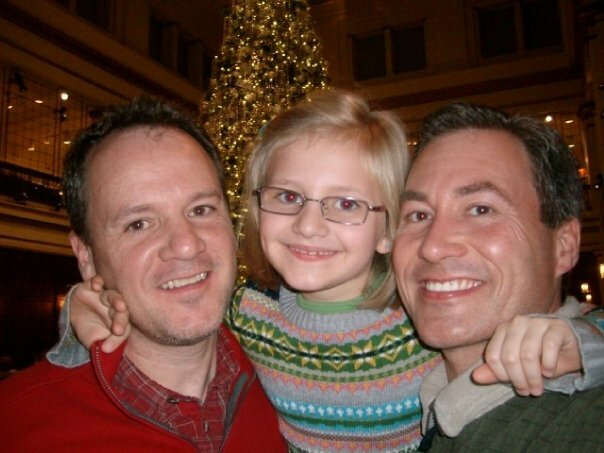 The next day, we met Gretel in downtown Chicago for a stroll through Macy’s before coming back to the Quad Cities and picking out and putting up our Christmas tree. 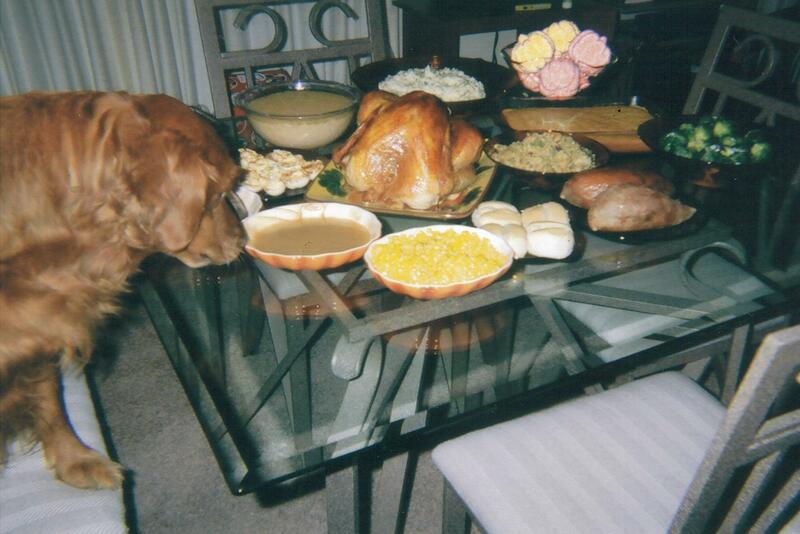 While we’ve had people over in the past, here is how ABBA and I spent Thanksgiving 2007. While Miss ABBA ate her fair share of goodies that day, she only sat at the table for the photo. 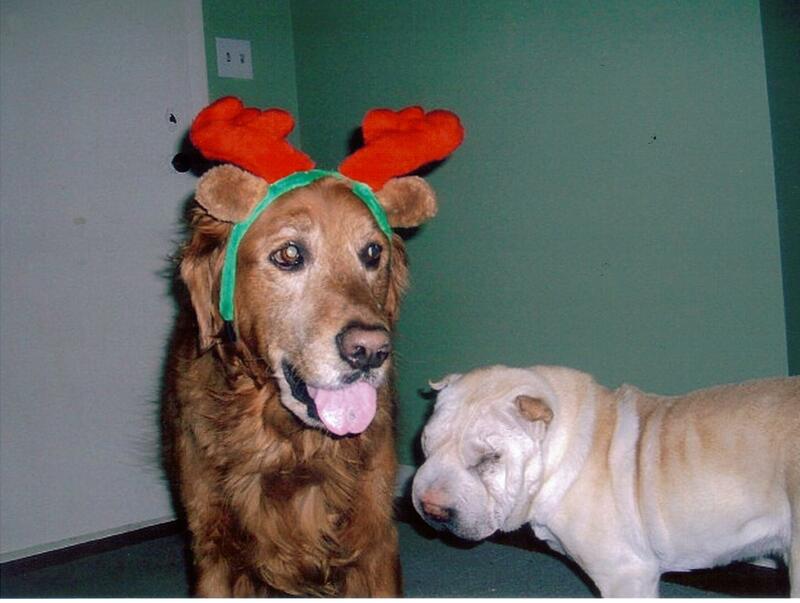 But, she definitely was sniffing the turkey and the gravy! As a child through the early 1990s, all of our Thanksgivings were at my Aunt Norma’s house. After that, I moved away and usually worked on the holiday. In the late-1990s through the early 2000s, I spent my Thanksgivings with Betty’s family in Andover, Ohio. 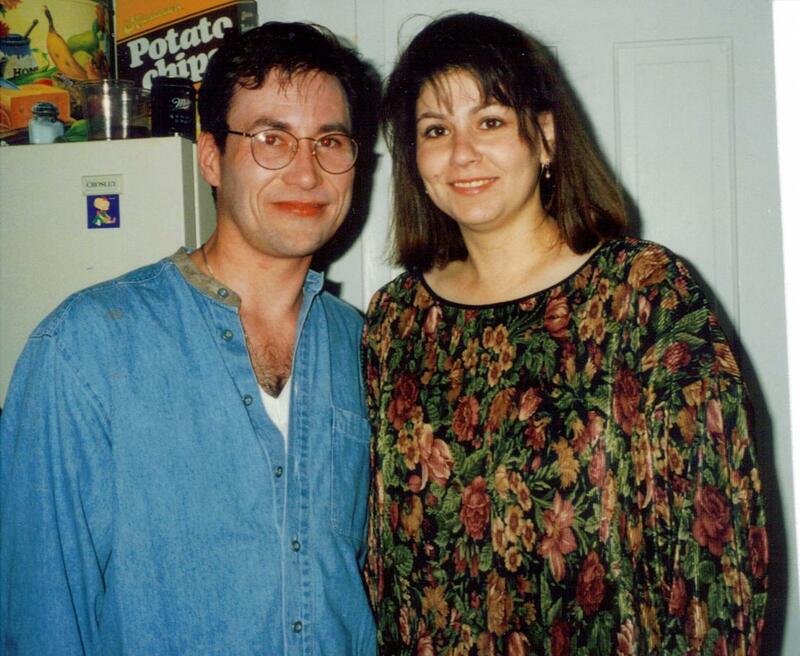 And, my final memorable Thanksgiving was in 1996. I was living in Rhinelander, Wisconsin, for my first television job. There were many of us that were new at the station that fall and none of us were able to go home. So, I made a big feast and then we went out partying afterwards. Closing down the bars and then working the morning show two hours later probably wasn’t a good call. Luckily, that only happened once! One of my friends celebrating with me that night was Elizabeth Goodsitt, who anchors at KWQC in Davenport, Iowa, the number one television station for news in the Quad Cities. With this flashback, I wish you a “Happy Thanksgiving” one day early!